CAMPBELL, CA--(Marketwire - August 26, 2010) - Market research firm Infonetics Research (http://twitter.com/infonetics) released its second quarter (2Q10) 2G/3G Mobile Infrastructure and Subscribers market share and forecast report. "It's been a tough year so far for the mobile infrastructure market, mainly due to the absence of spending in China and India. Last year, China spent like mad on its massive 3G rollout. This year, India was supposed to pick up some of the slack, but due to a combination of bans on Chinese vendors and a delayed spectrum auction, the spending virtually stopped in 2010. In fact, our analysis of capital expenditures by the three Chinese service providers in the first half of 2010 indicates that they have spent only 12% of their planned 3G budgets! The postponements in GSM upgrades and modernization will need to be addressed soon, and we are likely to see some interesting pick-up in both 3G in China and 2G in India in the second half of 2010," expects Stéphane Téral, principal analyst for mobile and FMC infrastructure at Infonetics Research. 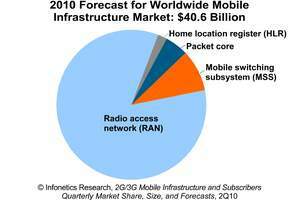 Infonetics' quarterly mobile infrastructure report provides worldwide and regional market size, market share, analysis, and forecasts for RAN equipment (base station controllers; macrocell, microcell and picocell base transceiver stations; W-CDMA remote radio head), mobile switching subsystem equipment (mobile switching center, soft MSCs, wireless media gateways), mobile packet core network equipment (GPRS gateway support nodes, serving GPRS support nodes, packet data serving nodes), HLR equipment, and mobile subscribers. Subscribers and most equipment are tracked by technology: GSM, W-CDMA, CDMA2000, TD-SCDMA, cdmaOne. Companies tracked include Alcatel-Lucent, Apertio, Cisco (Starent), Ericsson, GENBAND, HP, Huawei, Motorola, NEC, Nokia Siemens, Nortel, UTStarcom, ZTE, and many others. Infonetics Research is an international market research and consulting firm serving the communications industry since 1990. A leader in defining and tracking emerging and established technologies in all world regions, Infonetics helps clients plan, strategize, and compete more effectively.